NETWORK FINALS: SINGLE PARENTS lost 0.1 in final numbers. CABLE HIGHLIGHTS: MTV’s THE CHALLENGE led Wednesday cable, down 0.12 to 0.51, with lead-in RIDICULOUSNESS. at 0.22 compared to last week’s 0.30/0.28 On VH1, BLACK INK CREW edged up 0.02 to 0.49, and MARTHA & SNOOP’S POTLUCK returned at 0.29. 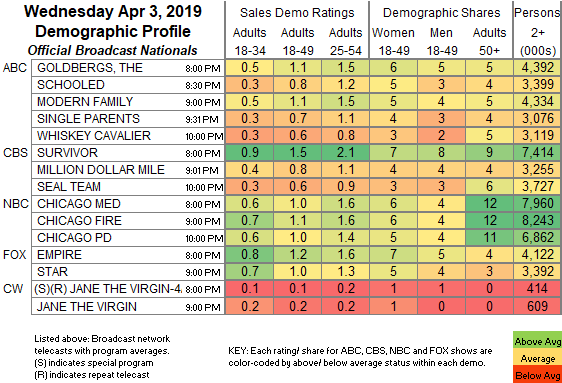 Bravo’s REAL HOUSEWIVES OF NYC slipped 0.02 to 0.42. On HGTV, HOUSE HUNTERS INTL rose 0.06 to 0.34, HOUSE HUNTERS grew by 0.04 to 0.33, and PROPERTY BROTHERS ticked down to 0.29. On ID, IN PURSUIT lost a tick to 0.28, and SEE NO EVIL was down 0.03 to 0.27. 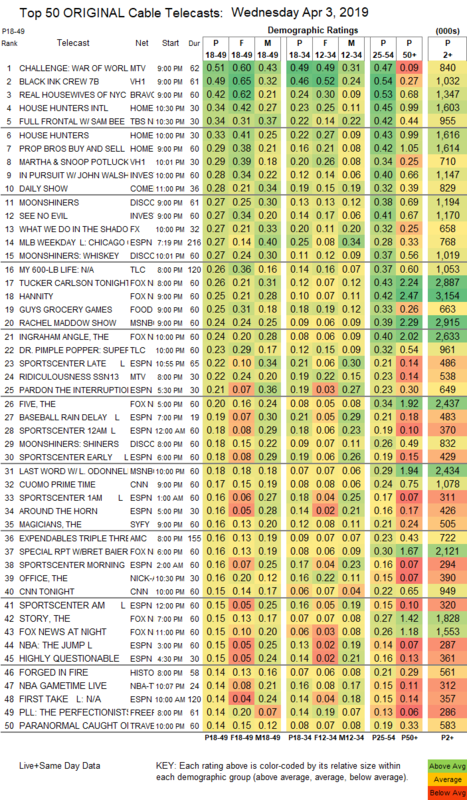 Comedy Central’s THE DAILY SHOW had another strong night, placing #10 at 0.28. Discovery’s MOONSHINERS shed 0.04 to 0.27, with a lead-out hour up 0.05 to 0.27, and the lead-in hour at 0.18. FX’s WHAT WE DO IN THE DARK had an unusual 0.06 increase from last week’s series premiere to 0.27. ESPN’s MLB game was at 0.27. On TLC, MY 600-LB LIFE dropped 0.05 to 0.26, and DR PIMPLE POPPER was at 0.23. Fox News’s TUCKER CARLSON TONIGHT led cable news at 0.26/0.43/2.9M, with MSNBC’s RACHEL MADDOW SHOW at 0.24/0.39/2.9M, and CNN’s CUOMO PRIME TIME at 0.17/0.24/1.1M. GUY’S GROCERY GAMES fell 0.07 to 0.25. On Syfy, THE MAGICIANS lost 0.03 to 0.16, and HAPPY was down 0.02 to 0.09. History’ FORGED IN FIRE was at 0.14. Freeform’s THE PERFECTIONISTS partly rebounded from last week, up 0.05 to 0.14. The season premiere of IFC’s BROCKMIRE was at 0.09, down a tick from last year’s premiere. POP’s SCHITT’S CREEK was up 0.02 to 0.08. The series finale of FXX’s YOU’RE THE WORST was steady at 0.07. WGMAmerica’s GONE fell off the chart, down 0.02 to 0.03/221K. Preliminary ratings are delayed by Nielsen until at least 9:30 am PT (90 minutes past due). The ratings service is performing extra “quality checks,” so be prepared for unusually high quality ratings later this morning!